Save the Date! 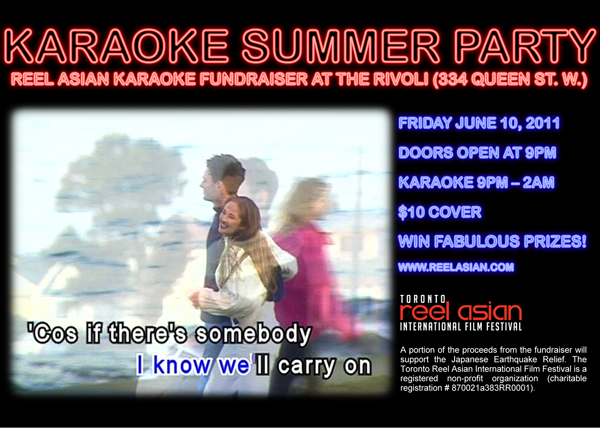 Reel Asian is bringing back our Karaoke Fundraiser Party on Friday June 10th at the Rivoli. Film Festival Passes + Tons of Movies! Asiansploitation, Astral’s Harold Greenberg Fund, Channel Zero, CP24, The Drake Hotel, E1, Ed’s Real Scoop, Gallery 44, The Grid, Japanese Canadian Cultural Centre, Khao San Road, Alison Kobayashi, Haircode Inc, Images Festival, imagineNATIVE Film + Media Arts Festival, Inside Out LGBT Film and Video Festival, Japan Foundation, Liaison of Independent Filmmakers of Toronto, Maple Pictures, Rainbow Cinema, Red Rocket Coffee, Ricepaper, The Royal Conservatory, Royal Ontario Museum, Soulpepper Theatre, Steam Whistle, V Tape, Warner, Women in Film & Television Toronto, Friends of Reel Asian.